Quality management is at the heart of Hindle Reman. We are ISO 9001:2015 certified through Lloyds Register, certificate number 10026148. 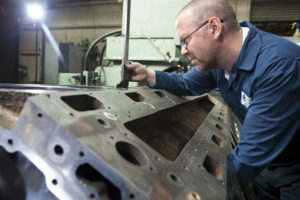 Whether re-machining a cylinder block for an engine builder or manufacturing a crankshaft for an original equipment manufacturer, our quality shines through. For remanufacturing we have a technical library which consists of a combination of OEM processes and specifications where these exist, complemented by Hindle procedures that have been gained through many years of experience. 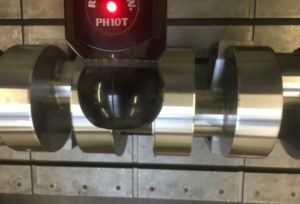 For manufacture, where we usually work to customer drawings or specifications, we have made significant investment in our inspection & quality departments, ensuring we continue to exceed expectations for the reliable supply of high quality components. Amongst our equipment is a LK Metre 4 coordinate measuring machine (CMM) fully updated with Renishaw controls, and Magnaflux MPI controlled by the latest Baugh & Weedon control panel. Hindle Reman recently played host to Laurie Caddell, editor of the magazine ‘The Engine Rebuilder’. Here is a link to the edition of the magazine that contains the feature that Laurie wrote about Hindle Reman – we hope you enjoy it!